COLORado Quad Zoom Tours wash the stage. A satellite for the main church in Leawood, KS since 2009, the permanent location is the first church to open in downtown Kansas City in 80 years. Forbes magazine has ranked Kansas City’s downtown district as one of the best in the U.S. Apparently, quite a few people agree. Drawn by its leafy parks, museums, theaters and ubiquitous barbeque restaurants, a growing number of people have flocked to the center of Missouri’s largest city, leading the population in its downtown to more than double since the beginning of this century. Recently, the district marked another milestone in its renaissance when it saw the opening of its first new church in over 80 years. The Church of The Resurrection — Downtown, a satellite of its parent church in Leawood, KS, was founded in 2009, but it didn’t have a permanent home in the city until June of this year. It opened a new facility at 1601 Grand Boulevard, on a site that was once the Kansas City Star’s parking lot. 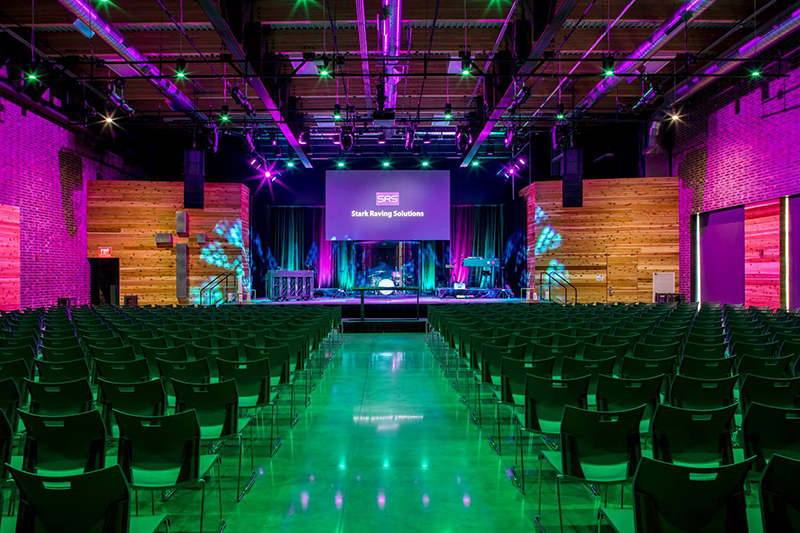 Built at a cost of $10.2 million, the new campus features a flexible color rendering house and stage lighting system installed by Stark Raving Solutions. Rogue RH1 Hybrids throw textures on the walls. Consistent with the forward-looking spirit of Kansas City, the new church campus incorporates some of the latest technology in its AVL Design. However, the Stark Raving Solutions team and the church’s tech arts and facilities director, Kenny DeCoursey, were careful to keep the focus of the new facility on serving the needs of real people in its diverse community. 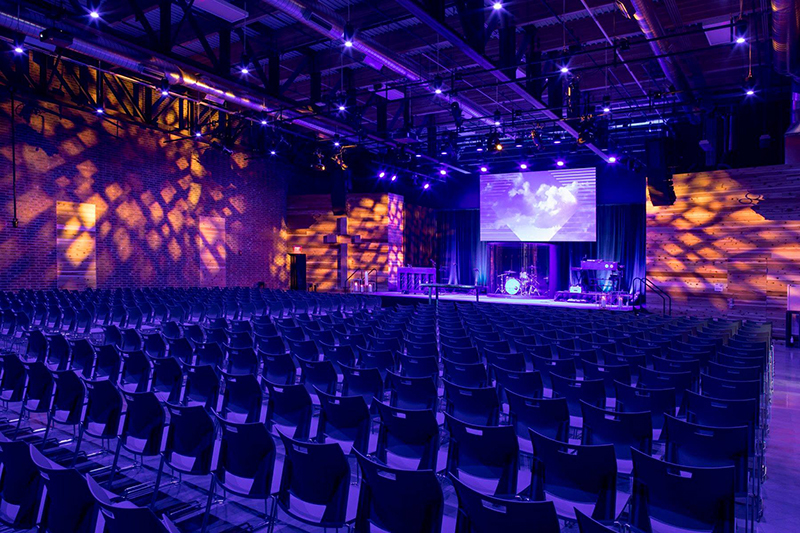 Making the decision to avoid white lights, DeCoursey and the team at Stark Raving Solutions opted to go with a house and stage lighting system centered on LED color-rendering fixtures. 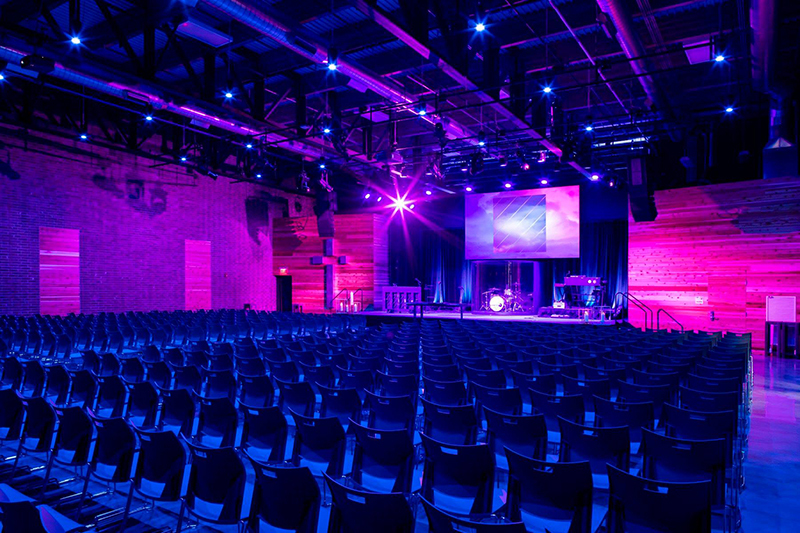 Aside from being able to immerse the entire 450- seat sanctuary in color, it was essential to them that their lighting system have the ability to change colors quickly from bold saturated hues to soft pastels, so it could reflect the emotional tone of services and support different types of activities. DeCoursey controls the new lighting system with a Jands Vista compact S3 controller. He also has the Paradigm Architectural system integrated for non-technical events. The stage wash is provided by 22 COLORado 1 Quad Zoom Tours and eight Ovation E-910FC ellipsoidals with 26˚ lenses from Chauvet Professional. The COLORado fixtures are hung on three stage electrics with two side pipes at 17’8” off the stage deck. Their 13° to 45° zoom and selectable dimming curve make it easy for the church to change looks during services by varying coverage areas. The Ovation ellipsoidal units are flown on the first and second house electrics and are used for color washes and specials. A collection of eight Chauvet Professional COLORdash Batten Quad-6 fixtures uplight the stage drapery. Accent lighting on the stage and throughout the entire room is provided by four Chauvet Professional Rogue RH1 Hybrid and an equal number of Rogue R1 Wash fixtures. Chroma-Q Inspire fixtures bathe the house in color. Since its opening a few months ago, The Church of the Resurrection Downtown has put the flexibility of its new lighting system to the test by hosting a wide range of events for men, women and children of all ages in addition to its normal Sunday services. With its broad color rendering capabilities, the new lighting system has been more than up to the task of creating a variety of look for this multi-functional church — and that has helped keep this downtown house of worship in the center of the action for its members.